It took 17 years, but the S&P 500 information technology index has finally recovered from the implosion of the dot-com bubble. The index of over 60 of the United States' largest technology companies yesterday rose 0.6% to close at a record high of 992.29, edging above its previous peak of 988.49, set on 27 March 2000. It was the ninth straight session of gains for the sector that has led the market in 2017 with a 22% rise, fuelled by rallies in a handful of heavyweight technology companies, including Apple, Facebook, Microsoft and Nvidia. Euphoria about the Internet's potential in the late 1990s fuelled a stock market rally that ultimately led to an 80% selloff as high-flying tech companies like Pets.com failed and others came close to collapse. The gradual recovery of the technology sector spanned the rise of social media, the revolution of cloud computing and the invention of smartphones, which made Apple the world's most valuable publicly listed corporation. "What a difference 17 years makes. In this day and age, companies can still not show a profit, but they have a true business," said Jake Dollarhide, chief executive officer of Longbow Asset Management in Tulsa, Oklahoma. "They have hundreds of millions of customers, and that's the big difference between the tech boom of 2017 and the tech boom in 2000." With Facebook up 43% so far in 2017, and Apple rising 30%, many investors worry that technology stocks have become too expensive. The S&P 500 tech index in June traded as high as 19 times expected earnings, its highest since 2007 before the US financial crisis. And a sell-off in tech stocks last month raised fears the sector's rally had come to an end. But even as it hit a record high on Wednesday, the S&P 500 information technology index appeared cheap compared to the dot-com era. At the index's previous peak in 2000, its valuation was equal to 48 times expected earnings. "It's a very different technology environment. 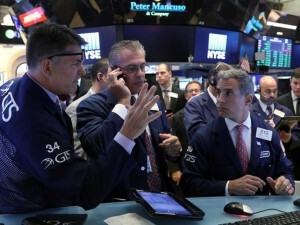 This has been a slow grind for years," said Phil Blancato, head of Ladenburg Thalmann Asset Management in New York. "There is some euphoria around tech, but there are also real earnings."